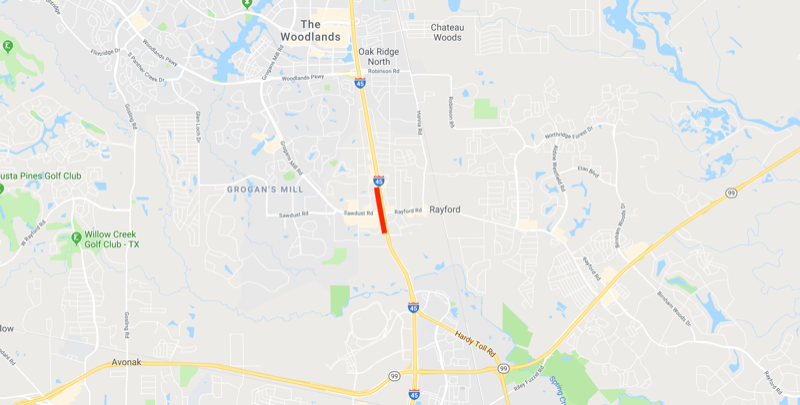 Please note that the total closure of IH 45 southbound at Rayford/Sawdust Road in the Woodlands has been rescheduled from this weekend to next weekend. The closure is now scheduled for 9 PM, Friday, January 25 to 5 AM, Monday, January 28, pending favorable weather conditions. Forecasted weather conditions this weekend are too wet and cold to lay concrete. The Texas Department of Transportation (TxDOT) will continue replacing the bridge deck on I-45 this weekend in Montgomery County. Closures will be similar to last weekend's closures but on the southbound side of I-45. There will be a total closure of I-45 southbound mainlanes at Rayford/Sawdust Road starting Friday, January 18 at 9 p.m. to Monday, January 21 at 5 a.m. The U-turns at the Rayford/Sawdust Road intersection will also be closed from Friday, January 18 at 9 p.m. to Monday, January 21 at 5 a.m., but drivers will be able to drive under the freeway on Rayford/Sawdust Road.